Of all the updates, features and fixes we’ve put out this month, my favourite has been the new skins we’ve put on for Creately. The previous skins were fine and we felt they did a decent job, but as we prepare to get out of our beta phase we wanted to give Creately a truly professional finish. We hope you like our new togs. We’re added a whole bunch of nice little UI tweaks as part of the new clothes we’re put on Creately. Simple little bubbles come up to help you work better with Creately. Along with these new tool tips, we’ve improved mouse interactions so there’s no more mouse flicker and far greater responsiveness from Creately. We’ve also fixed some niggling bugs around resizing of shapes, multi-select and copy’n’paste. Timing out of Creately will also no longer be a problem now that we’ve got a quick login window – so all you serious diagram-philes can keep Creately running all day. Many of you may not have realised this, but most of our Shapes are also containers. What does that mean? Certain shapes (for example the Browser Shape in the UI library) behave as containers giving them context specific properties. When you drop another Shape into a Container Shape, the 2 shapes can interact smartly to give you special behaviour that makes working in Creately a breeze. Going back to the Browser Shape example, next time you drop a TextBox into it, you will notice a green border around the container. 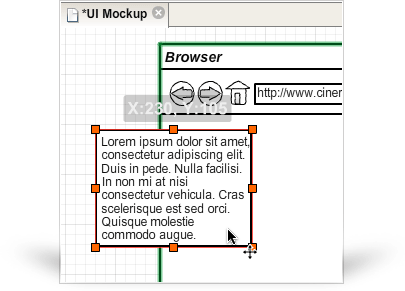 In this case, the TextBox shape will stick itself to the Browser without requiring you to lock or group the objects. That’s what we mean by intuitive! Those little lines that run all over your diagrams have had a major face-lift too. Now when you group and select, your connectors are included, and these connectors are now smarter than ever. With our new Magic Gluepoints, you can stick a connector to any part of your object and it stays there. To use this, simply mouse-over the connector endpoint on any part of a Shape, until a large dot is revealed. When you see the dot, release your mouse and the connector will now be fixed to that point. That’s ultimate flexibility built right into Creately. Expect even more innovation with our connectors in the next release. We know you love your shortcut keys, so we’re added a whole lot of them to Creately. And its easy to find them as well. We’ve added a new Help panel next to the Share and Comments window on the right of the drawing canvas. We’re working on adding more Help tips as we go along, so keep checking back. And here’s one that should make using Creately easier right away – Next time you’re entering text in Creately you can use the TAB key to save the Text and exit the edit mode. If you don’t want to commit the text, just press the ESC key and we’ll drop all your changes. 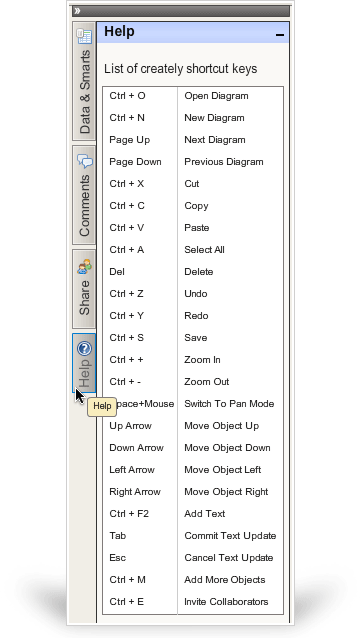 When not editing text you can also use the TAB key to move between fields and components in Creately. 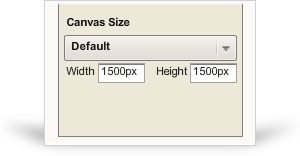 As you’ve started to use and like Creately, we’ve noticed your diagrams are getting bigger and bigger by the day – we understand, so we’re introduced a new Page Size feature, that will let you define the size of you drawing canvas when creating a new diagram. 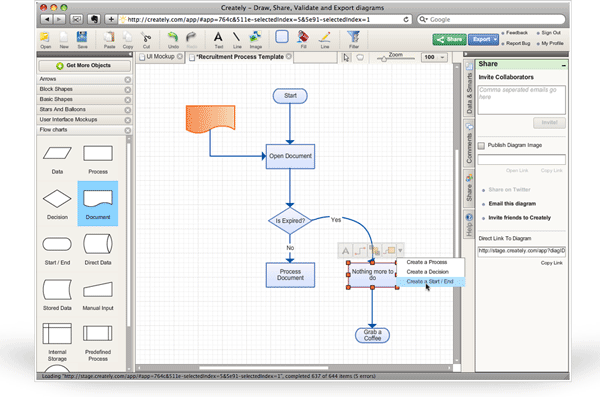 Now you can work on those large scale design projects without worrying about running out of space in your diagram. Did I mention Clearer too? 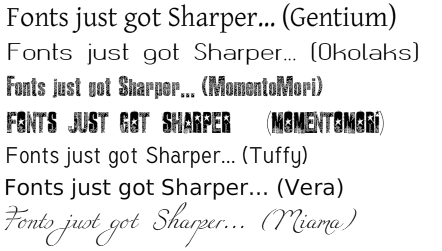 In the last release we introduced a whole bunch of new Fonts, but our users told us the fonts needed to be sharper and clearer. So our Dev team put on their thinking hats and we’re reworked our fonts to make them a whole lot more crisp and print ready. Check it out- they’re beautiful. PS… Keep those ideas coming.